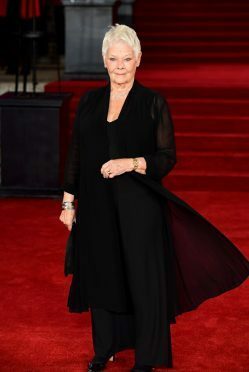 Dame Judi Dench has said she struggles to enjoy watching films because of her deteriorating eyesight. The acting legend, 82, has been living with macular degeneration, which causes the gradual loss of vision. Dame Judi previously told how the condition has left her unable to read scripts, but she has not let it slow her career and she was honoured in Santa Barbara on Thursday for her excellence in film. Jeff Bridges, who was presenting the award, said he would vote for Dame Judi for an Academy Award for her “brilliant” performance in Victoria & Abdul, in which she revives her role as the 19th century monarch. But Dame Judi shrugged off speculation of winning her second Oscar and instead chose to praise Christopher Nolan’s Dunkirk, although she admitted enjoying cinema is now difficult. “Because my eyesight is so bad now, I can’t actually see very much and so I do go but a friend of mine usually has to say, ‘He’s kissing her now’ or ‘He’s walking away’,” she said. Dunkirk features Harry Styles, 23, in his film debut but while the name of the One Direction singer can cause a frenzy among fans, it does not for Dame Judi. “Well, it shows how ignorant I am,” Dame Judi said, surprised. Dame Judi was presented with the Kirk Douglas Award for Excellence in Film by the Santa Barbara International Film Festival. Previous recipients of the annual honour include Robert De Niro, Michael Douglas, Quentin Tarantino and Harrison Ford.